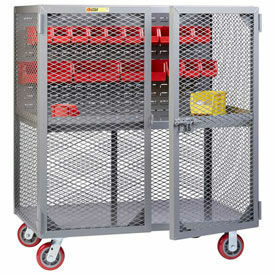 All-Welded, 22 Gauge Steel Mobile Storage Cabinets Feature Heavy-Duty Casters For Mobility In Offices, Warehouses And More. All-Welded Mobile Storage Cabinets are ANSI/BIFMA certified and hold up to a 230 lb. capacity. Shelves adjust on 2 centers. Double doors lock with 3 point latching and recessed handles prevent banging and catching with a flush surface. Steel constrruction provides long lasting durability. The 5 polypropylene swivel casters (2 with brakes) are attached with a 6 W heavy-gauge steel plate that bolts through to 1-1/4" angle iron inside the cabinet, both running the length of the cabinet. Push Handle sold separately. Fits 24"D models. Steel caster components are zinc treated to resist corrosion. Total caster capacity is 1100 lbs. Available color finishes are Black, Blue, Burgundy, Charcoal, Green, Gray, Putty, Red or Sand. Ships assembled. Hallowell Solid Door Mobile Storage Cabinets Are Designed For Transportable General, Office And Industrial Storage. Hallowell Solid Door Mobile Storage Cabinets are made of 20 and 22 gauge steel, all welded construction for long lasting durability and dependability. Industrial models designed to meet government requirements. Combines ample storage space for supplies and personal belongings with neat, attractive appearance. 3-point positive locking and chrome plated locking handle with built-in grooved key lock provides security. Shelves adjust on 2 inch centers with triple flanged front for added strength (up to 200 lbs. - uniformly distributed). All-welded frame assembly and factory hung reinforced doors ensure proper operation and fit. Wheels provide mobility. Greenguard Children and Schools Certified. Series types are Commercial and Industrial. Color finishes are Gray, Midnight Ebony and Parchment. Capacities are 1,000 lbs. and 1,250 lbs.. Dimensions vary per type. Quantity is 1. 2 Year Limited Warranty. 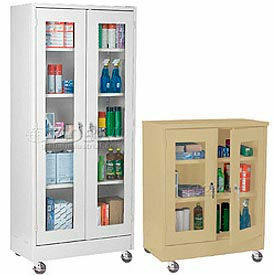 Tennsco Welded Mobile Deluxe Cabinets Are Used For Office Or Warehouse Storage Needs. Mobile Deluxe Cabinets are made of old rolled steel using 24 gauge steel body reinforced with a 22 gauge steel frame for long lasting durability. Reinforced doors include 3-point locking system with die cast chrome plate locking handles for security. Locking flat bar rods include nylon guides for smooth door operation. 22 gauge steel shelves are height adjustable at 2" increments. 150 lb. shelf capacity. Mobile kit adds 6 3/4" to height of cabinet and includes 4 four-inch diameter swivel casters, (2 with brakes). Made from non marring PVC plastic. 36" wide. 78-3/4" in height. 18" and 24" depths. Available Unassembled or All-welded. Colors are Light Grey, Black, Medium Grey, Sand and Putty. 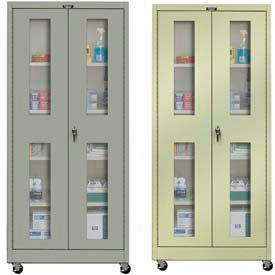 Lyon All-Welded, Heavy-Duty Mobile Storage Cabinets Offer Excellent Security And An Extended Service Life. These extra wide, 14 gauge steel storage cabinets measure 60 W x 24 deep. Cabinets include 6 diameter polyolefin casters (2 swivel with brakes, 2 rigid) with a 2800 lb. total capacity. Portable storage cabinets feature 4 shelves with 1450 lb. capacity per shelf that bolts securely into keyhole slots and adjust at 3 increments on channels that vertically reinforce the unit. Shelves are 14 gauge steel with flanged edges for added rigidity. 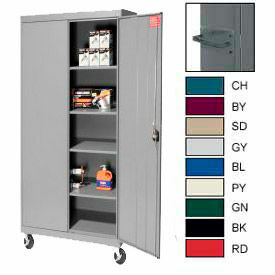 Mobile storage cabinet doors close with a 3-point locking mechanism made with 3/8" thick round locking bars. The cabinet door handle is rugged, diecast steel with a 3/8" thick padlock hasp. Each door has 3 heavy duty welded hinges with 5/16" diameter brass hinge pins to keep contents secure. Shipped assembled and ready to use. Baked enamel finish. Lifetime Limited Warranty. 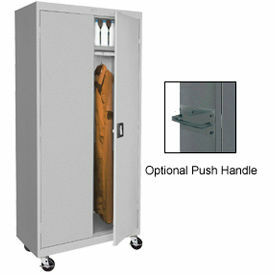 Hallowell Safety-View Door Mobile Storage Cabinets Provides Maximum Storage Versatility. Hallowell Safety-View Door Mobile Storage Cabinets are made of 20 and 22 gauge steel, all welded construction for long lasting durability and dependability. Doors permit viewing of contents through transparent windows. Industrial models designed to meet government requirements. Combines ample storage space for supplies and personal belongings with neat, attractive appearance. 3-point positive locking and chrome plated locking handle with built-in grooved key lock provides security. Shelves adjust on 2 inch centers with triple flanged front for added strength (up to 200 lbs. - uniformly distributed). All-welded frame assembly and factory hung reinforced doors ensure proper operation and fit. Wheels provide mobility. Greenguard Children and Schools Certified. Series types are Commercial and Industrial. Color finishes are Gray, Midnight Ebony, Parchment and Platinum. Capacities are 1,000 lbs. and 1,250 lbs.. Shelf capacities are 200 lbs. and 250 lbs.. Dimensions vary per type. Quantity is 1. 2 Year Limited Warranty. Mobile Cabinets Feature High Impact, Acrylic Windows That Provide Maximum Content Visibility. 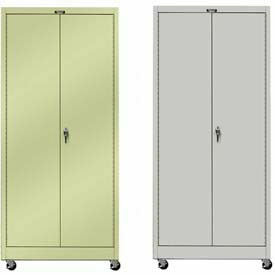 These commercial grade clearview mobile storage cabinets are made with all-welded steel construction and a powder coat finish for long lasting durability. The shelves on these steel storage cabinets adjust on 2 centers and meet ANSI/BIFMA standards. The raised fixed bottom shelf protects contents from damage. Doors securely lock with 2 chrome swing handles and a 3-point locking mechanism. These storage cabinets are available in Black, Light Gray, Putty or Sand. Shipped assembled (casters and handle require assembly). 5 Year Limited Warranty. 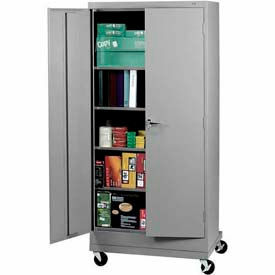 36 W Mobile Storage Cabinets are 24 gauge steel with 180 lb. capacity, 24 gauge shelves. 46 W Mobile Storage Cabinets are 22 gauge steel with 230 lb. capacity, 20 gauge shelves. Mobile storage units include 5" polypropylene swivel casters (2 with brakes) which attach with a 6"W heavy-gauge steel plate that bolts through to 1 ¼ angle iron inside the cabinet, both running the length of the cabinet. Steel caster components are zinc treated to resist corrosion. Total caster capacity is 1100 lbs. These 22 Gauge, Expanded Metal Mobile Cabinets Feature 14 Gauge, Ventilated Door Windows That Provide Unlimited Content Visibility. Cabinet doors lock with 2 chrome-locking handles and a 3-point locking system to secure contents. These cabinets also feature 4 height adjustable shelves that adjust at 2 increments and meet ANSI/BIFMA shelf standards. The raised fixed bottom shelf protects contents from damage. These industrial storage cabinets have a scratch resistant powder coat finish and are available in Charcoal, Light Gray and Putty. Shipped assembled. 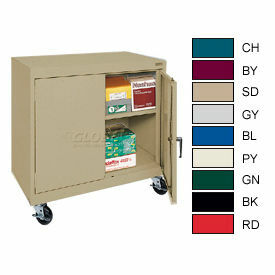 Mobile Storage Cabinets include 5" polypropylene swivel casters (2 with brakes). Patented steel caster components are zinc treated to resist corrosion. 1100 lb. total caster capacity. 36"W storage cabinets have 180 lb. shelf capacity. 46"W storage cabinets have 230 lb. shelf capacity. 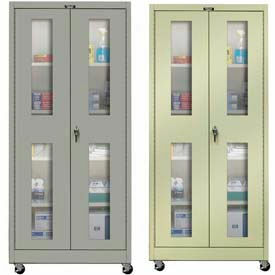 Hallowell Ventilated Door Mobile Storage Cabinets Are Used For Transportable Storage Requirements. Hallowell Ventilated Door Mobile Storage Cabinets are made of 20 and 22 gauge steel, all welded construction for long lasting durability and dependability. Doors permit viewing of contents through transparent windows. Industrial models designed to meet government requirements. Combines ample storage space for supplies and personal belongings with neat, attractive appearance. 3-point positive locking and chrome plated locking handle with built-in grooved key lock provides security. Shelves adjust on 2 inch centers with triple flanged front for added strength (up to 200 lbs. - uniformly distributed). All-welded frame assembly and factory hung reinforced doors ensure proper operation and fit. Wheels provide mobility. Greenguard Children and Schools Certified. Series types are Commercial and Industrial. Color finishes are Gray, Midnight Ebony, Parchment and Platinum. Capacities are 1,000 lbs. and 1,250 lbs.. Shelf capacities are 200 lbs. and 250 lbs.. Dimensions vary per type. Quantity is 1. 2 Year Limited Warranty. Little Giant® Heavy Duty Mobile Tool Security Cabinets Provide Secure Visible Storage For Tools, Machinery, Parts And More. 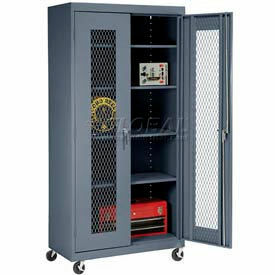 Little Giant® Heavy Duty Mobile Tool Security Cabinets are constructed of all welded steel for long lasting durability. Doors swing open a full 270 degrees and feature a slide latch with padlock hasp to reduce tampering and theft. Expanded metal walls offer ventilation as well as visibility for quick visual inventory checks. Two swivel and two rigid casters. Wheels are Polyurethane. 56" high cabinets are 24" deep, with widths of 48" and 60". Capacity is 2000 lbs. Shelf configurations vary per model. 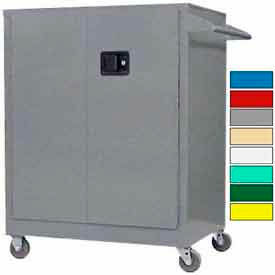 Durable 22 Gauge Steel Counter Height Cabinets Are Used For Offices Or Warehouses. 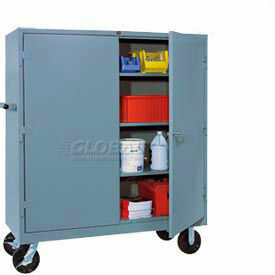 These industrial strength mobile storage cabinets measure 36 H to provide an additional work surface area. Heavy-duty casters provide unlimited mobility. These storage cabinets have a shelf capacity up to 180 lbs. and meet ANSI/BIFMA standards. Shelves adjust on 2 centers. Model 245128 has single door and cam locking L-shaped chrome swing handle. Model 245129 has two doors and a three point locking L-shaped chrome swing handle. The 5 polypropylene swivel casters (2 with brakes) on these mobile storage units are attached with a 6 W heavy-gauge steel plate that bolts through to 1 ¼ angle iron inside the cabinet, both running the length of the cabinet. Steel caster components are zinc treated to resist corrosion. Total caster capacity is 1100 lbs. Mobile storage cabinets are available in Black, Blue, Burgundy, Charcoal, Green, Gray, Putty, Red or Sand durable powder coat finish. Shipped assembled. 5 Year Limited Warranty. Securall® Counter High Mobile Industrial Cabinets Organize and Store Tools and Materials In Factories And Office Environments. Securall® Counter High Mobile Industrial Cabinets are all welded, 18-gauge steel for long lasting durability and chip and peel resistant coating. Double wall cabinet doors feature full length piano hinges and lockable flush mounted door handle for obstruction free, finger tip operation. Industrial cabinets are made with three-point self-latching doors to add even more security. Equipped with two rigid and two factory installed swivel 4" locking casters and a sturdy push handle. Industrial cabinets come with two adjustable shelves that each hold up to 500 lbs. Fully assembled. Available in Blue, Gray and Red. All other colors are Special Order.